TYLER, John, (father of David Gardiner Tyler), a Representative and a Senator from Virginia, a Vice President and 10th President of the United States; born in Charles City County, Va., March 29, 1790; attended private schools and graduated from the College of William and Mary, Williamsburg, Va., in 1807; studied law; admitted to the bar in 1809 and commenced practice in Charles City County; captain of a military company in 1813; member, State house of delegates 1811-1816; member of the council of state in 1816; elected as a Democratic Republican to the Fourteenth Congress to fill the vacancy caused by the death of John Clopton; reelected to the Fifteenth and Sixteenth Congresses and served from December 17, 1816, to March 3, 1821; declined to be a candidate for renomination in 1820 because of impaired health; member, State house of delegates 1823-1825; Governor of Virginia 1825-1827; elected as a Jacksonian (later Anti-Jacksonian) to the United States Senate in 1827; reelected in 1833 and served from March 4, 1827, to February 29, 1836, when he resigned; served as President pro tempore of the Senate during the Twenty-third Congress; chairman, Committee on the District of Columbia (Twenty-third and Twenty-fourth Congresses), Committee on Manufactures (Twenty-third Congress); member of the State constitutional convention in 1829 and 1830; member, State house of delegates 1839; elected Vice President of the United States on the Whig ticket with William Henry Harrison in 1840; was inaugurated March 4, 1841, and served until the death of President Harrison on April 4, 1841; took the oath of office as President of the United States on April 6, 1841, and served until March 3, 1845; did not seek reelection; delegate to and president of the peace convention held in Washington, D.C., in 1861 in an effort to devise means to prevent the impending war; delegate to the Confederate Provisional Congress in 1861; elected to the House of Representatives of the Confederate Congress, but died in Richmond, Va., January 18, 1862, before the assembling of the Congress; interment in Hollywood Cemetery. American National Biography; Dictionary of American Biography; Monroe, Dan. 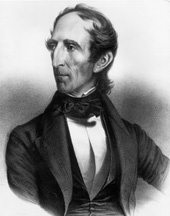 The Republican Vision of John Tyler. College Station: Texas A & M University Press, 2003.